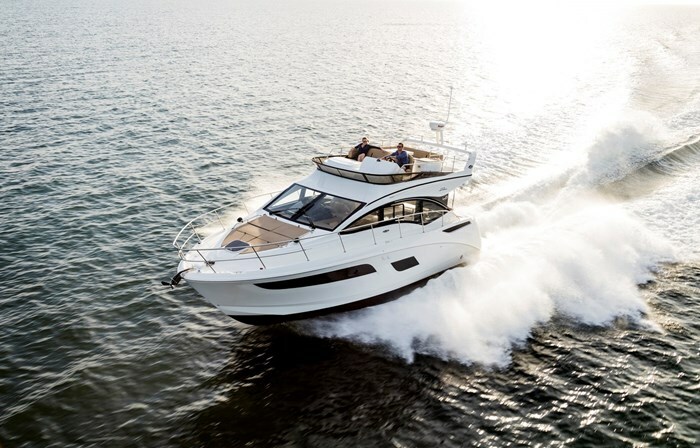 Sea Ray’s 400 Fly is one of only four and the smallest fly bridge in its thirty-five model lineup for 2016 ranging from nineteen to sixty-five feet. 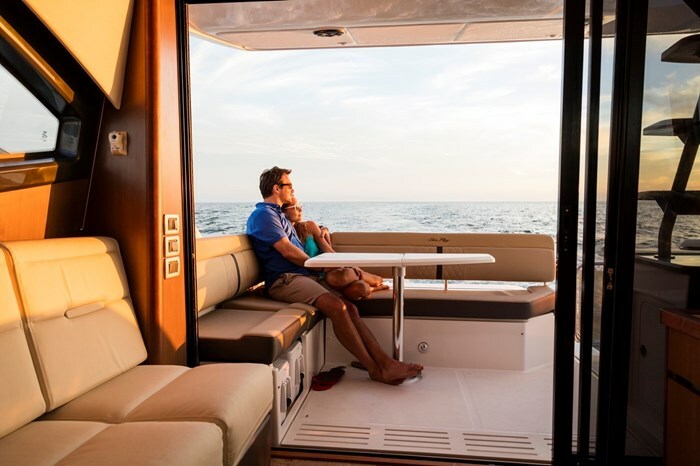 The 400 Fly nevertheless offers many of the same desirable features as its larger siblings; open floor plan with plenty of entertainment possibilities, lots of natural lighting, long range cruising for two couples or a family of five with privacy, and a generous standard equipment offering. Main deck entertainment flexibility is enhanced enormously with the three-panel, full height glass sliding salon/cockpit door with flush threshold which, when open, creates one huge single level social area from the transom through the salon to the standard lower helm station and the well equipped and accessible galley opposite. Seating abounds from the standard L-shaped lounge which virtually fills the cockpit and then immediately inside the salon another L-shaped sofa/lounge continues forward on the starboard side right to the lower helm and across the back of it. Opposite on the aft port side of the salon is another two person sofa/ottoman. Surrounding high salon windows plus the windshield bathe the salon in natural lighting. Tables for both the cockpit and salon are optionally available. Climbing the port side stairs from the cockpit brings you to the bridge deck which is unusually large and accommodating for a forty-footer. Everyone can join you up here with again a huge L-shaped lounge across the back and up the starboard side to the double-wide upper passenger seat. The seatback of the double-wide passenger seat flips forward to create U-shaped dinette/lounge seating utilizing a standard multi-leaf cocktail/dining table. Opposite is a storage cabinet with countertop and ahead of that, the single portside driver’s swivel helm chair. 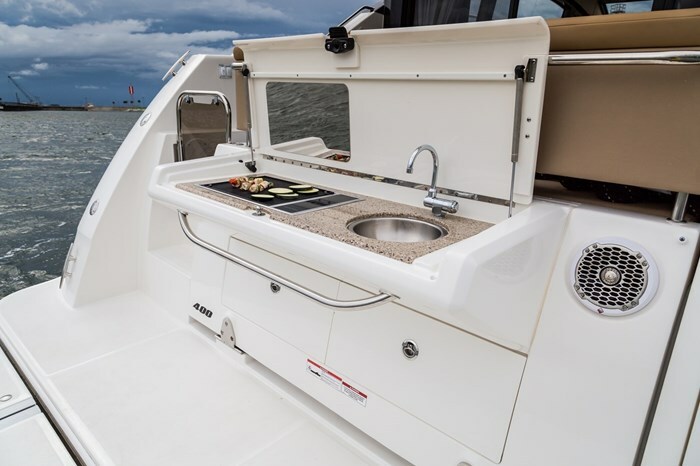 The L-shaped galley features wood flooring, countertop with stainless steel sink, microwave, refrigerator-freezer, two burner electric stove, lots of cupboards and drawers, power vent, plus recessed bottle storage and a trash receptacle. A standard 11 kW generator supplies AC power when not on shorepower. Two units of zone-controlled reverse cycle air conditioning-heating keeps the 400 Fly’s interior just the way you like it. A few steps down and forward lead from the salon to the staterooms and head. The forward master stateroom features a double island-style bed with Visco elastic foam mattress complete with fitted sheet set, pillows and spread. Storage drawers plus a hanging locker is provided. Virtually the entire length of this stateroom benefits from the natural lighting from hullside windows on both sides. An LED Smart TV with Blu-ray™ player is standard. 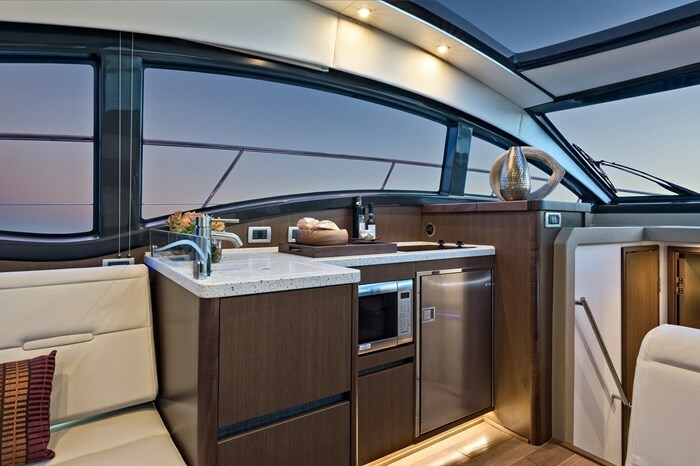 To port is the head compartment with separate shower stall and shower door, VacuFlush® head, storage cabinets, mirror, vanity, vessel sink, and tile flooring. 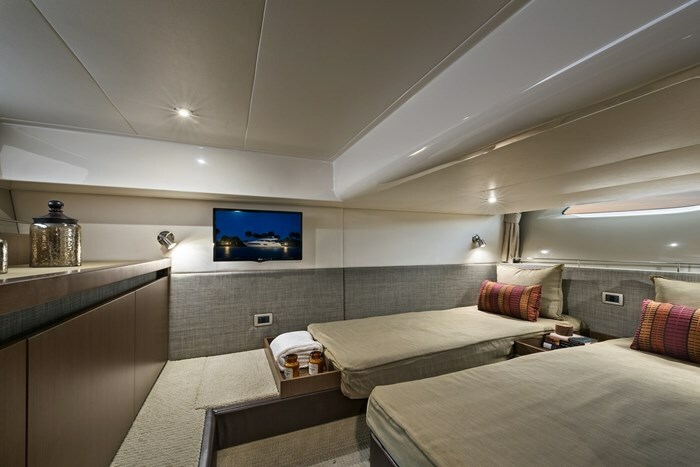 To starboard, opposite the head compartment, is a huge closet system which, if you need to, may be optionally replaced with a second head compartment which is a virtual duplicate of the master head. 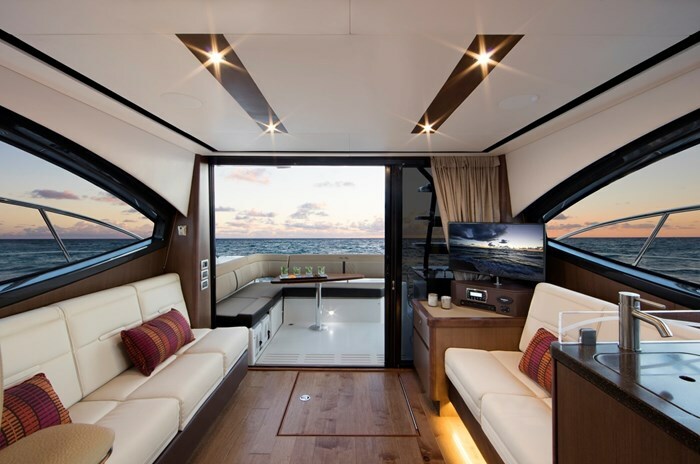 Utilizing the full beam of the 400 Fly, the aft stateroom offers three single berths, two of which may be slid together into a “kingsize”, and the third, located along the starboard hullside, may be optionally replaced with huge storage cabinet. This aft stateroom of course has its own privacy door, hanging locker, storage compartments, plus more fitted sheets, pillows, and spreads. 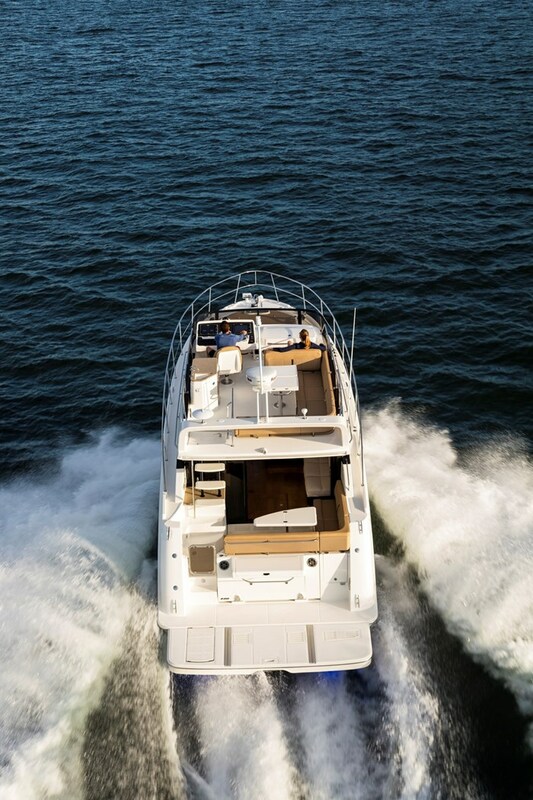 Both the bridge and lower helms of the 400 Fly are similar in that they both come equipped with complete SmartCraft® Digital Throttle & Shift (DTS), engine diagnostics, and instrumentation. 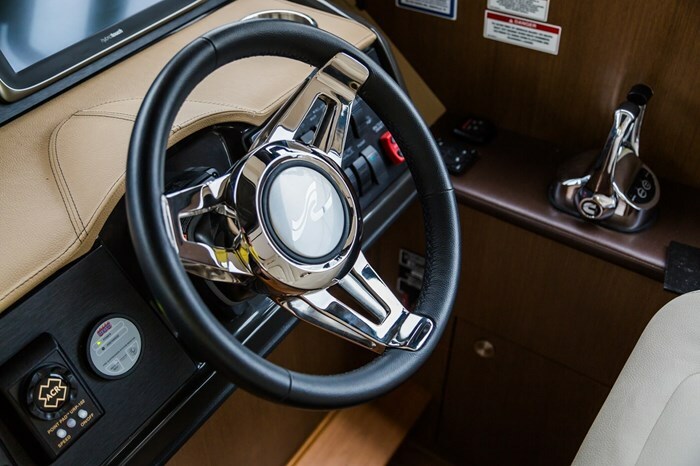 Both helms have standard Raymarine® e125 Widescreen colour LCD GPS/Chartplotter/Radar plus a VHF radio. The lower helm adds a windshield defroster. 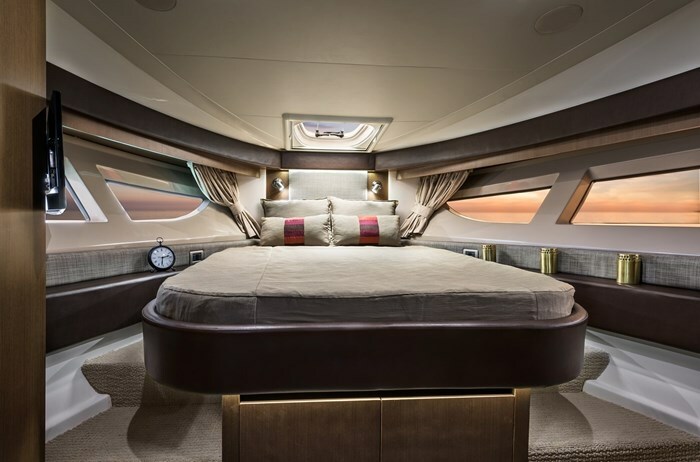 Most notable additional standard equipment includes a centralized stereo with remote controls, wireless Bluetooth™, and media inputs, salon LED Smart TV with remote Blu-ray™ player, foredeck recessed double sunpad with folding backrest and cover, bridge and cockpit seat covers, two carry-on coolers with dedicated cockpit storage, central vacuum, chestnut wood cabinetry, Glendenning® Cablemaster system, remote spotlight, windshield wipers, anchor, windlass, and rode, trim tabs, cockpit shower, transom washdown, plus twin 480 horsepower Cummins® QSB 6.7 diesel inboard engines with V-drives. Most notable options include hull colour choices, a wide selection of Raymarine® electronics, audio system premium upgrades, bow thruster alone or with a stern thruster, joystick docking system, fly bridge bimini top or hardtop, cockpit clear enclosure, foredeck and/or cockpit sunshades, refrigerator for cockpit and/or bridge, pull-out bed salon sofa, wine cooler, screen for the salon door, and perhaps the best option, an extended fixed or hydraulically lowering swim platform, and with this option, either rear-facing transom seating or the transom gourmet station with grill, sink, and storage.